Cantonment Board Saugor published Recruitment Notification for 19 Clerk, Safaiwala, Peon. All eligible and interested candidates can register online or before 22-11-2016 . 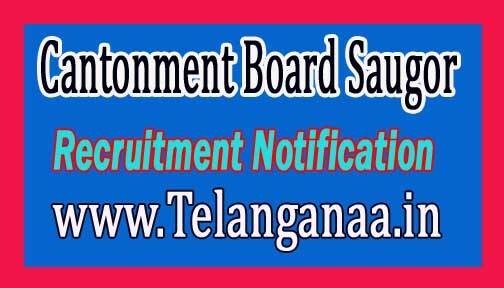 Further detailed information about education qualifications, age limitation, selection procedures, examination pattern, curriculum for the Cantonment Board Saugor Recruitment 2016 - 19 Clerk, Safaiwala, Peon Post is mentioned below. Age limit - Candidate age should be between 18 and 25 years (post 1,2,5), 18 to 30 years (post 3,4). Age relaxations apply according to the rules. Educational Qualifications - Candidates should have completed 8/12/10 / ITI or equivalent qualification from a recognized university. Selection Procedure - All eligible candidates will be selected for their performance in the written exam, skill test, physical test. Number scale - Rs. 5200 - 20,200 / - With 1900 / - Grade Pay (Post 1,2), Rs. 4440 - 7440 / - With 1300 / - Grade Pay (Post 3-5). How to apply - All eligible entrants and interested candidates must submit a written copy of the application together with relevant certificates (mentioned in detailed advertising) to the following address before or on 22 November 2016. Address -Chief Executive Officer, Saugor Cantonment Board, 54 Mall Street Saugor-470001.